Eighteen people were arrested for obstruction of the highway, after refusing to leave the road to allow vehicles access to the arms fair. The Occupy camp established on the day continued as a visible challenge to the arms fair at its Eastern entrance throughout the week. Meanwhile at least one activist managed to enter the site on a mission to remind arms dealers of the consequences of their business. Monday: World’s largest arms company blockaded for three hours and direct action at the ExCeL centre. Silent vigil attracts hundreds of people. Welsh protest challenges drones link. Activists blocked access to Lockheed Martin for three hours before being arrested. In Central London campaigners superglued themselves to the entrances of the offices of Lockheed Martin, the world’s largest arms company, which is exhibiting at DSEI. They prevented access for three hours. Police arrested five people who were not released until the following morning. On the day 30,000 arms dealers arrived in London for the official opening of the arms fair, campaigners were there to meet them at London City Airport: to help them find their way (the long way round!) and point them out to fellow passengers. See the video of this action here. This clearly had an impact as later in the week, announcements were heard at Custom House station, advising DSEI delegates to remove their passes before boarding the train! An activist climbed on the roof of the ExCeL at Prince Regent station, while others challenged the arms dealers below. See the video here. A journalist had his press credentials removed for using the hashtag ‘#stopdsei’ and filming the protest. The NUJ have condemned the decision. Meanwhile it emerged that illegal weapons were being advertised inside the fair. Thursday: Woman arrested for leafleting! Campaigners take the message to parliament. Arms dealers dinner disrupted. Campaigners took the message to parliament ahead of a debate on the government’s arms sales unit. A woman was arrested at Custom House DLR station for attempting to leaflet arms dealers entering the fair. She was released five hours later without charge. A critical mass cycle ride converged with other protesters at the Troxy, where a “charity” event for arms dealers was taking place. Protesters obstructed the entrance, and engaged local residents with information about the arms fair. An ‘arms’ themed installation appeared on a lamp post nearby. See a photo report of the protest here. Friday: Occupy camp joined by campaigners for protest on final day of the fair. Vince Cable’s constituents hold vigil at his surgery. Hundreds of ‘DSEI End Product’ cards, designed to remind arms dealers of the human impact of their trade, found their way into hotel rooms, bars, and car parks. Local constituents challenged Vince Cable on the government’s role in organising the arms fair at a vigil at his surgery in Twickenham. Cable is responsible for the departments which both approve export licenses and promote weapons sales abroad. The amazing Occupy camp, which survived wind, rain and sabotage to maintain a 24-hour challenge to the arms fair at its Eastern entrance was joined by others for a final protest before packing up as the arms dealers headed home. We won’t let them come back. 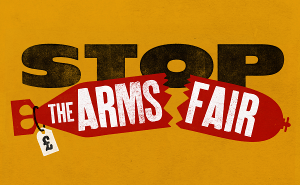 Pay a visit to an arms fair exhibitor near you.